Your digital presence is more important than ever. 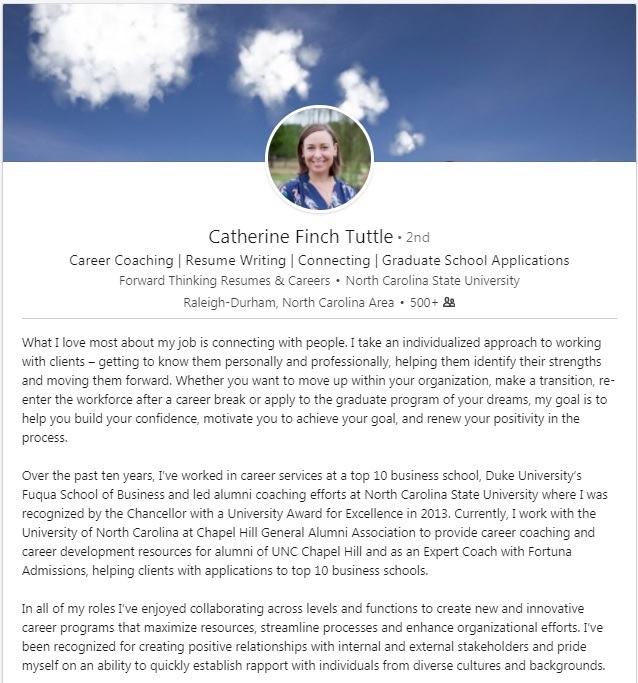 Check our career coach’s example page and best practices to make sure your LinkedIn profile is making a great first impression. 1. Use a photo: LinkedIn users with a photo are more than 14 times more likely to be viewed by recruiters and other connections. It doesn’t have to be a professional photo but it should be professional. Dress for the role/industry/opportunity you want. 2. A headline should speak to others: Your headline is automatically your current job title but it doesn’t have to be. Be strategic and just like your resume, make sure it speaks to the job you want, not the job you have. 3. Use keywords: Using key words in your headline and summary will ensure recruiters and hiring managers are able to find you. 4. Create a custom URL: This shows a certain savvy with the site and looks more professional when included on resumes, business cards and email signatures. (see option below the ‘add profile section’). 5. Complete your profile: Your goal should be to establish a minimum of 50 connections to optimize your visibility. A completed profile will make others more likely to connect with you. For more information on how to update your LinkedIn profile and navigate the site, GAA members can view a recorded webinar.